The Gran Turismo 49 combines the pleasures of speed cruising with the space for family and friends to enjoy incredible luxury. She promises memorable moments underway and at anchor. 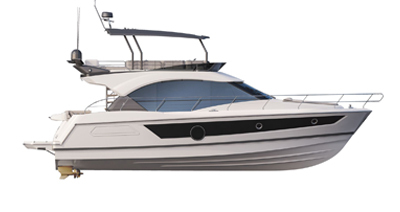 Taut lines and a sporty look, the Gran Turismo 49 boasts a spirited temperament. The atmosphere inside is a marriage of walnut wood in contrast to glossy lacquered furniture and padding in shades of taupe, bronze and cream. The opportunities to personalize the boat are many: lacquer colors, worktops, floor coverings, upholstery etc. A large locker to aft provide storage space for a nine foot inflated dinghy with its engine in place. The submersible swim platform is designed to take a load of 770 lbs: the dinghy or jet-ski can be stored in it when underway. The Gran Turismo 49 is constructed with a Volvo IPS 600 (2 x 435 HP) engine. IPS technology makes her responsive and easy to manipulate. Internationally noted for reduced fuel consumption and increased engine efficiency, Beneteau is the first brand to develop a hull specifically for IPS and is considered an expert in this field. The owner and guest cabins have a king-size bed and bathroom ensuite with separate shower. The GT49 comes in a choice of two or three cabin versions. In the two cabin version, an additional lounge is situated below the salon, providing a private cozy space. The Gran Turismo 49 galley is spacious and bright and fully fitted. It has lots of clever storage spaces including the ingenious ‘magic corner’. This makes cooking on board a real pleasure!